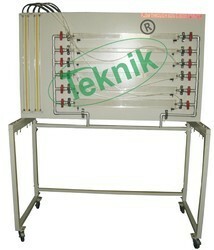 We are manufacturer of Fluid Mechanics Lab Equipments. 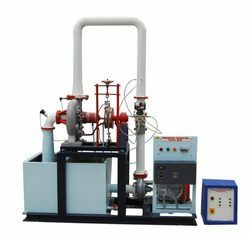 We are offering Fluid Mechanics lab Equipments Like Study of Pipe Fittings, Pelton Turbine, Bernoulli's Theorem Apparatus, Series And Parallel Pump Demonstration Unit, Friction in Pipe Lines Apparatus, Notch Apparatus, Metacentric Height Apparatus, Impact of jet Apparatus, Nozzle Meter Apparatus, Reynolds Apparatus etc. We are suppling best Qualitiy and wide range of Fliud mechanics Lab Equipments. Our company offers optimum quality Orifice and Mouthpiece Apparatus at the most reasonable market price. 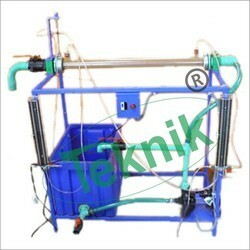 This apparatus is manufactured under the supervision of expert professionals, using best quality raw materials. 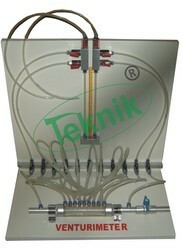 The apparatus manufactured by us is used for the purpose of measuring fluid flowing through an open channel. Offered apparatus is exclusively demanded in various hydraulic industries for accurate performance and hassle-free installation. 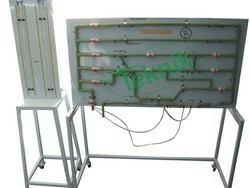 We are offering a wide range of fluid Mechanic lab equipment for engineering colleges. 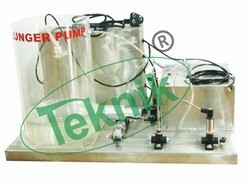 Our company offers optimum quality plunger pump demonstration unit . 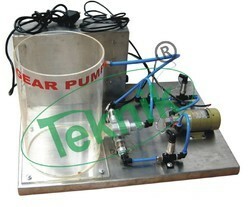 Small scale plunger pump demonstration unit. Capable of being linked to a not supplied via an interface console an essential accessory. Supplied with software providing full instructions for setting up, operating, calibrating and performing the teaching exercises. Facilities provided for logging, processing and displaying data graphically. 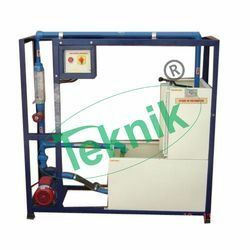 The Basic Hydraulic Bench is of volumetric type and has been designed to provide continuous and controlled supply of water to conduct various experiments using auxiliary modules in typical Fluid Mechanics and Hydraulics Laboratory. The unit is an ideal service unit for conducting student projects. Once filled, no external water supply is required. Water is recycled between the Experiment Module, Measuring Tank and the Storage Tank by the Centrifugal Pump.Several experiments in Fluid Mechanics and Hydraulics require continuous and controlled supply of water. 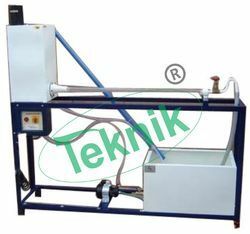 The Basic Hydraulic Bench provides a controlled recirculation water supply to conduct experiments.The Basic Hydraulic Bench is a very important module and is recommended for all Fluid Mechanics and Hydraulics Laboratories in Educational Institutions. It is a basic module for flow related experiments using auxiliary modules. Axial Fan Demonstration Unit - We are one of the leading manufacturers & exporters of Axial Fan Demonstration Unit in India. This Axial Fan Demonstration Unit Consists of a shelf contained bench top unit with a small scale axial fan and all the necessary instrumentations. Transparent ducting at both inlet and outlet flows allows operation of the axial fan impeller and measuring devices to be clearly observed. An orifice plate is installed in the ducting to enable measurements of air flow rates, which can be varied by means of an aperture control device. The unit can be connected to a PC for convenient data logging and recording of experimental data. Our organization is involved in offering Francis Turbine Test Rig to our clients. This Francis Turbine Test Rig is free from defects and gives exceptional performance owing to its excellent design and precise dimensions. This Francis Turbine Test Rig is available at reasonable price and has been engineered with perfection. Additionally, this Francis Turbine Test Rig is free from all sorts of defects and is dispatched within allotted time frame. This equipment allows the measurement of force developed by a jet of water impinging upon a stationary object. The apparatus consist of a rectangular acrylic vessel. Water is fed through a nozzle and discharged vertically to strike a target carried on a stem which extends through the cover. Force of the jet is measured by the Load Cell about fixed fulcrum. Theoretically obtained forces are compared with practically obtained forces through moments. Set of Nozzle: 6 mm , 10 mm, and 12 mm (Brass). calculate the theoretical impact velocity. Using the theoretical equation for the impact force of a jet, calculate the impact force. Compare the theoretical and measured values. To determine the reaction force produced by the impact of jet of water of variety type of target vanes. • To determine the co-efficient of discharged through Venturimeter and orifice meter. • To measure discharge through Venturimeter, Orificemeter and Rotameter. • To calibrate the Rotameter. • Electric Supply: 230V 50Hz. With proper earthing. • Exterior material: Stainless steel plate baked enamel. • Temp. range: -70 to 150oC. Set up consists of a centrifugal pump coupled with electrical motor, supply tank,measuring tank & pipe fittings for closed loop water circulation. Pressure and vacuum gauges are connected on delivery and suction side of pump for the purpose of measurement. 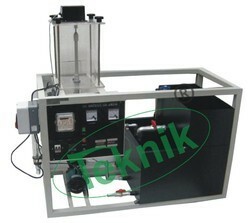 The flow rate of water is measured using measuring tank and stop watch provided. to plot head vs. Discharge, pump efficiency vs.
earth voltage less than 5 vac. ) 5a, three pin socket with switch for pump. 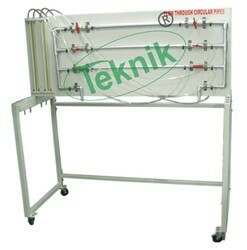 • The setup consists of a two sided clear fabrication section. Water is fed through a nozzle and discharged vertically to strike a target carried on a stem which extends through the cover. A weight carrier is mounted on the upper end of the stem. The dead weight of the moving parts is counter balanced by a compression spring. The vertical force exerted on the target plate is measured by adding the weights supplied to the weight pan until the mark on the weight pan corresponds with the level gauge. A total of two targets are provided, a flat plate and a hemispherical cup. • Stainless Steel enclosure: Having of opposite sides made of glass. • Instruction Manual: An ENGLISH instruction manual will be provided along with the Apparatus. • Pipes (2 Nos. ): Material GI of ½” & 1” diameter. These are Following characteristics can be studied at different Speeds. Discharge V/S Input to pump. Calculate the output of the pump, given the discharge and the total head. 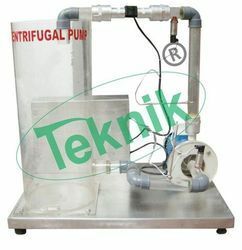 The Gear Pump Demonstration Unit utilizes a gear pump which is the most widely used of the positive action rotary pumps. Two gear wheels operate inside a casing. One is driven whilst the other rotates in mesh with it. the liquid is carried around in the space between consecutive teeth and then ejected as the teeth mesh. the pump has no valves. It is a positive displacement pump and will deliver against high pressures. The output is a more even flow than that of a reciprocating pump. It is particularly suitable for high viscosity fluids. The type of flow in which the particles move in a straight line in the form of a thin parallel sheets is known as the Laminar flow. Laminar flow denotes a steady condition where all stream lines follow parallel paths. Under this condition, the dye will remain easily identifiable as a solid core. The type of flow in which the particles move in a zigzag pattern is known as the turbulent flow. Turbulent flow denotes as unsteady condition where stream lines interact causing shear plan collapse and mixing occurs. As the flow rate is increased, the transition from laminar to turbulent flow is a gradual process. This zone of change is defined as transitional flow. This will appear as a wandering dye stream prior to dispersion as turbulence occurs. Marble glasses (kanchi) for smoothness of flow. The Impact Of A Jet setup consists of a two sided clear fabrication section. Water is fed through a nozzle and discharged vertically to strike a target carried on a stem which extends through the cover. A weight carrier is mounted on the upper end of the stem. The dead weight of the moving parts is counter balanced by a compression spring. The vertical force exerted on the target plate is measured by adding the weights supplied to the weight pan until the mark on the weight pan corresponds with the level gauge. A total of two targets are provided, a flat plate and a hemispherical cup. Impact of jets apparatus enables experiments to be carried out on the reaction force produced on vanes when a jet of water impacts on to the vane. To measure the force developed by a jet of water impinging upon a stationary object and comparison with the forces predicted by the momentum theory. Impact of jets apparatus enables experiments to be carried out on the reaction force produced on vanes when a jet of water impacts on to the vane. Our company is the major in offering Laminar Turbulent Flow Apparatus to the clients. This product is widely used to measures. Laminar Turbulent Flow Apparatus is offered in different specifications as per client's requirements. Offered range is highly acknowledged among clients due to its impeccable finish, excellent robustness and optimum performance. The Orifice Discharge Apparatus has been designed to enable students to determine the co-efficient of discharge of sharp edged orifice and nozzles. . 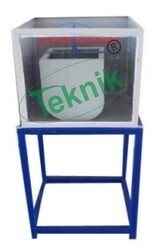 It consists of a vertically mounted cylindrical transparent plastic water tank. Water is supplied from the hydraulic bench or any closed circuit controlled water supply system. The orifice is fitted in the base of the tank using special fittings flush with the inside surface. The head above the orifice is maintained constant using adjustable overflow pipe and the level is indicated by the level scale. Determining the contraction and velocity coefficients. Establishing the coefficient of velocity for a small orifice. We are able to offer a wide range of Pelton Wheel Test Rig. It is manufactured using high grade raw material and innovative technology in compliance with globally accepted norms of quality. The offered range is widely acclaimed in the market, owing to its specific attributes like high efficiency and fine finishing. Our Clients can avail the pelton wheel test rig from us within stipulated time period. 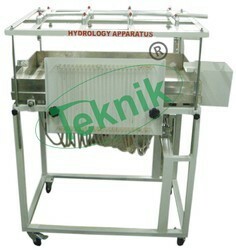 In order to meet the varied demands of the clients, we have come up with Drag Co-Efficient Apparatus. These are designed to determine the relationship between the drag coefficient of falling particles and their Reynolds number value. To conduct detailed experiments the product is provided with several vertical glass tube with two marks on the walls that allows single particles to fall from them and enables easy observation. 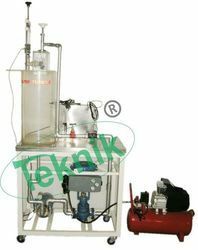 Further the product is provided with a value system at the bottom for easy removal of the particles with minimum loss of liquid. 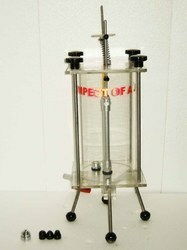 Fluid Friction Apparatus allows students to study flow, flow measurement techniques and losses in a wide variety of pipes and fittings. 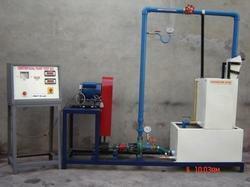 The equipment has three water circuits with instruments,pipes and pipe system components. These allow students to examine and compare the different component characteristics. 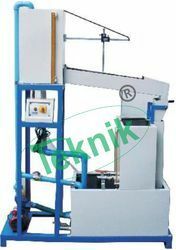 A hydraulic bench (Gravimetric ) or Volumetric , available separately) supplies the circuit with a controlled flow of water. A space-saving vertical panel holds all the parts for easy use. To measure pressure loss across components, students use a piezometer set and differential pressure gauge (included). To perform experiments students record the temperature of water in the hydraulic bench and set the hydraulic bench to pump water through a circuit. They measure pressure losses across instruments or components. 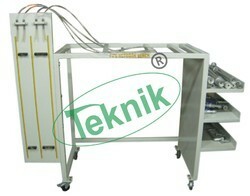 The hydraulic bench gives an external flow rate for referenceand comparison. The flow measurement instruments show students the common methods of measuring water flow. They also give applications of the steady flow energy equation (Bernoulli’s equation). Students use a Venturi meter and an orifice plate meter and compare the losses of each. They also find the losses in a rapid enlargement. 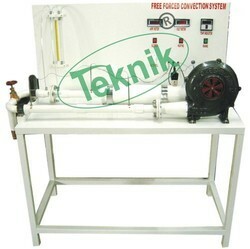 Fluid Friction Apparatus Shows flow and losses in different pipes, fittings and valves. Shows popular flow measurement instruments. 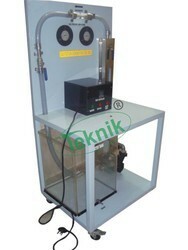 We are manufacturing and supplying supreme quality Cavitation Demonstration Unit for our esteemed customers. 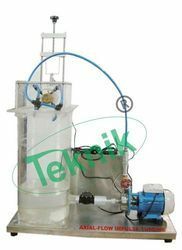 This Cavitation Demonstration Unit is processed using high quality raw material which ensures its standard quality and long service life. Our presented product passes through diverse quality parameters for inspection. 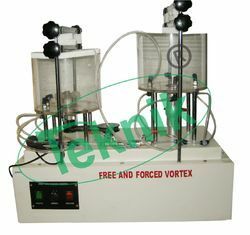 Moreover, it can be availed from us at reasonable costs.This Apparatus are one of the most important in fluid mechanics Lab. The Cavitation Demonstration Unit offers a clear and easyto-understand display of cavitation. In severe cases, cavitation will damage machines and hydraulic systems. Designers and engineers must be awareof cavitation when they create a new design or installation. 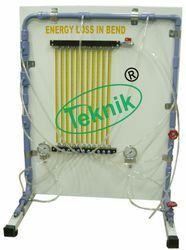 Cavitation Demonstration Unit is a purpose-designed teaching unit which enables efficient and effective investigations into the causes and effects of cavitation. It also allows students to understand the Venturi by studying upstream and throat pressures. The Cavitation Demonstration Unit offers a clear and easyto-understand display of cavitation. Students create clearly visible cavitation in a Venturi which has a transparent window and take measurements of flow and pressure. Students use theory and practical experiments to learn how to predict the onset of cavitation. They gain practical experience of using the continuity equation and Bernoulli’s equation. They use these to calculate flow and pressure,The apparatus is a self-contained, mobile unit. It consists ofa robust frame which holds a water tank or reservoir, anelectric pump, a flow-control valve, a flow meter and a Venturi. The frame includes a handy worktop for student paperwork. They gain practical experience of using the continuity equation and Bernoulli’s equation. Pressure gauges show the pressure upstream of the Venturi and the pressure at the Venturi throat. A thermometer shows the temperature of the water in the tank. The pump includes electrical protection and the water tankincludes a splash cover to prevent water spillage. We are engaged in manufacturing supplying and exporting the best quality of Flow Measurement Apparatus. Comparative flow coefficient of venturi meter, orifice meter and rotameter. Comparative head loss of venturi meter, orifice meter, sudden enlargement, sudden contraction,90 degree elbow and rotameter. Direct measurement of differential pressure for venturi meter and orifice meter. Direct measurement of head loss for sudden enlargement, sudden contraction, 90 degree elbow and rotameter. Calculation of flow coefficient for venturi meter and orifice meter. The is designed for use with the Gravimetric or Volumetric Hydraulics Benches (available separately). These benches measure absolute flow rate which can be used by students to find the Venturi meter coefficients over a range of flow conditions. The Venturi meter is a device used to measure the flow rate. As shown, it consists of a tapering contraction section, along which the fluid accelerates towards a short cylindrical throat, followed by a section which diverges back to its original diameter. As velocity increases from the inlet section to the throat, there is a fall in pressure, the magnitude of which depends on the rate of flow. The flow rate may therefore be inferred from the difference in pressure, as measured by pizometers placed upstream and at the throat. The device is used to determine the discharge coefficient or the Venturi meter coefficient (C). This value lies between 0.92-0.99 and varies from one meter to another. We have garnered praise of manufacturing highly qualitative Flow Through Non Circular Pipe.These are manufactured using quality-approved raw materials in accordance with industrial norms and guidelines. These are used in civil engineering laboratories for applications that involve friction between fluids of different kinds. Easy to set up and install, these are made available to clients at reasonable prices. These are supplied to clients in different specifications at affordable prices. Friction head losses in straight pipes of different sizes can be investigated over a range of Reynolds' numbers from 103 to nearly 105, thereby covering the laminar, transitional and turbulent flow regimes in smooth pipes. A further test pipe is artificially roughened and, at the higher Reynolds' numbers, shows a clear departure from typical smooth bore pipe characteristics. In addition to the smooth and roughened pipes, a wide range of pipeline components are fitted, including pipe fittings and control valves, allowing investigation of the losses caused by this type of connection. A clear acrylic section of pipeline houses a Venturi meter, an orifice plate assembly and a Pitot tube, so that these can be investigated as flow measurement devices. 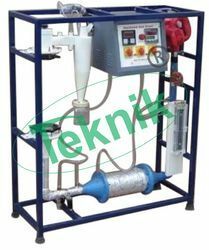 Our organization is counted among the listed manufacturers, wholesalers and exporters of premium quality Bernoulli’s apparatus. Offered apparatus is precisely manufactured under strict supervision in compliance with industry laid parameters. These units consist of a rectangular transparent flow section through which water is to be flown. The velocity of water changes across the sectional area of channel changes. We have garnered praise of manufacturing highly qualitative Flow Through Circular Pipe. These are manufactured using quality-approved raw materials in accordance with industrial norms and guidelines. These are used in civil engineering laboratories for applications that involve friction between fluids of different kinds. Easy to set up and install, these are made available to clients at reasonable prices. These are supplied to clients in different specifications at affordable prices. Micro Teknik Pressure Drop Through Packed Bed. Under the supervision of our skilled technocrats, these machines are manufactured as per the latest technological advancements utilizing quality approved raw materials. Offered product is acknowledged for its robust construction, low maintenance, longer functional life and energy efficiency. We offer pressure drop in both, standard and customized specifications to our valuable clients. 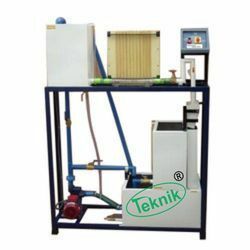 Micro Teknik We are leading manufacturer and exporter of a wide range of Fluidized Bed Dryer. The Salt is fluidized, each particle meets the hot air, discharges moisture, gets dry and at the same time travels forward without any mechanical push. We have proven-technology for designing dryers of any capacity. In this state, the solids behave like a free flowing boiling liquid. Clients can avail this products as per there requirements. The apparatus is a self contained unit for studying basic hydrology. 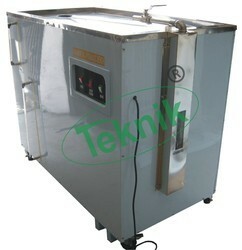 It consists of a large stainless steel rectangular tank with adjustable tilting mechanism. The tank is filled with a granular medium. Two separate sets of four spray nozzles above the tank simulate rain fall on the catchments. The tank upper walls are transparent. Valve control of the nozzles varies the lag time on the hydrograph to simulate a moving storm. The compartments at each end of the tank are connected to the catchment area by wire mesh to allow flow between the compartment and the catchment. 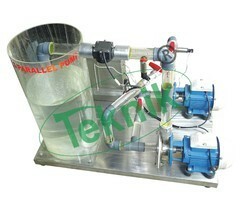 Two wells with valve control are also provided at the middle of the tank. Twenty pressure tappings along the orthogonal axes of the tank to measure water table profile by a manometer bank. 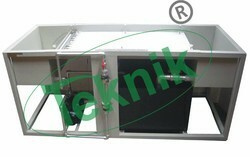 Tank : Stainless steel 100 cm wide x 200 cm long x 19 cm high. .Inclination : 0-3% .End compartments : 2 ea. .Wells : 2 ea. .Spray nozzles : 8 nozzles with separate shutoff valves. Rain water : Variable area flow meter. Run off : Calibrated weir. Manometer : 1 ea.Upper walls : Clear acrylic. Power supply : 220 V, 1 Ph, 50 Hz. Other power supply is available on request. Free Forced Convection System It is because of the vast domain knowledge and astute expert guidance, we have been able to bring forth a broad gamut of Heat Transfer in Forced Convection Apparatus that are designed with utmost precision. Followed by our manufacturing process, these apparatuses are checked in order to ensure a range that is free from flaws and are capable to offer maximum performance at the clients' end. 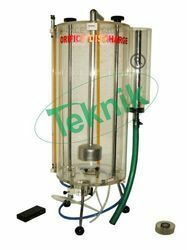 Metacentric Height Apparatus Complete withCollecting Tank:Micro Teknik For the purpose of providing the best Metacentric Height Apparatus to our clients, we use raw materials of the finest quality and strictly as per the set industrial standards, the quality standard never deteriorates. Made available in the market at a very competitive price, the offered product of impeccable functionality and efficiency, is one of the best available in the market. 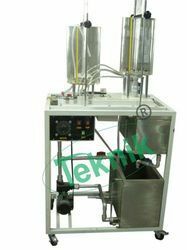 Reynold’s Apparatus Complete with Collecting Tank:Micro Teknik We are among the trusted names engaged in the manufacturing, trading and exporting of best quality Reynolds Apparatus. The set-up we offer is basically a self-contained water re-circulating unit, provided with a sump tank and a centrifugal pump. 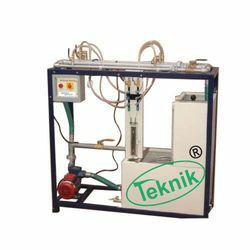 Our professionals manufacture this apparatus in accordance with the industry set parameters using best quality raw materials. 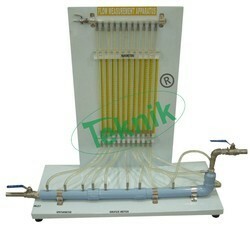 This apparatus is used to measure flow rate and is available at affordable market prices.